Captain America: Civil War opens May 6, beginning summer movie season. “It’s not actually summer!” you might argue, but historically, this is when studios start rolling out their blockbuster slates, hoping to topple some box-office records in the process. When you look at the highest-grossing movies in U.S. history, two of the Top 10 occurred last summer — and four in the last four summers — so naturally, industry observers are salivating over the potential grosses soon to come. 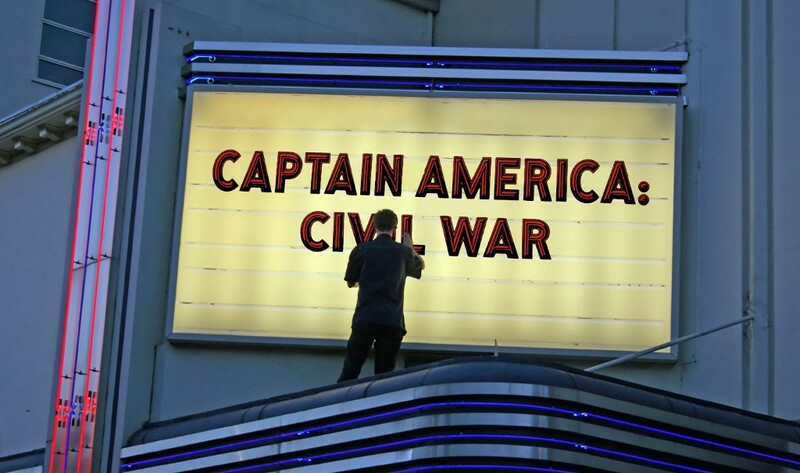 Can Civil War surpass The Avengers ($623 million in 2012)? Can Finding Dory overtake Finding Nemo ($339 million in 2003) or even Pixar champ Toy Story 3 ($415 million in 2010)? The dollar amounts are dizzying, even seductive. The killjoy may come across as an annoying know-it-all, but he’s right. One of Hollywood’s dirty little secrets is that it measures “popularity” and “success” in a way that no other entertainment industry does. The music business counts individual record sales; the television industry looks at Nielsen ratings and DVR views. Sure, these methods are imperfect in their own ways, but at least those businesses tabulate purchases (or streaming views) to gauge what counts as successful. Since at least the 1930s, Hollywood doesn’t do this: Every Sunday, box-office estimates are announced and we’re told how much money each movie made. Forget that these charts don’t specify the different kind of tickets sold for, say, IMAX or 3D screenings. 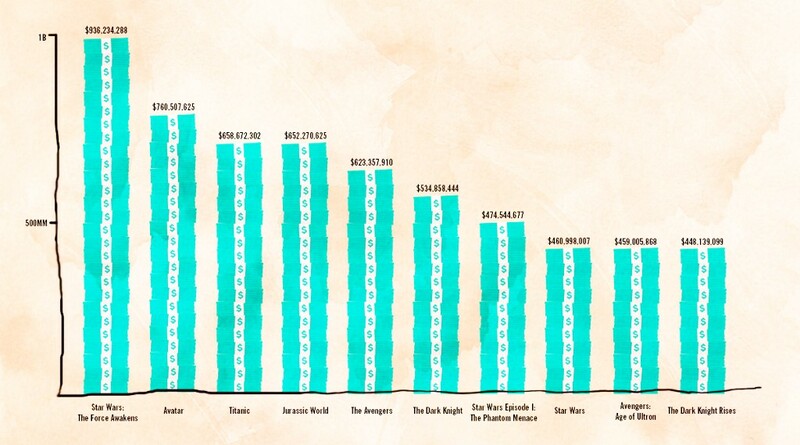 Also consider that when we talk about the highest-grossing films of all time, we compare the dollars made by modern movies against ones made 35 years ago. But, as your grandparents might complain, movie prices from 1980 do not match movie prices of today. Not in the slightest. Few quibble with Hollywood’s strange way of recording box-office numbers because, let’s face it, there are more important things in the world than figuring out whether Avatar or E.T. was a bigger hit. But when Star Wars: The Force Awakens shattered records over the Christmas holidays, becoming the biggest U.S. moneymaker ever, a few sites (such as Deadline and Fast Company) pointed out how simple inflation throws a monkey wrench into these apples-and-oranges tabulations. And while such articles may feel spiteful or needlessly wonky, if you actually look at the chart of the highest-grossing U.S. films versus the adjusted-for-inflation recalculation, you start to understand why Hollywood prefers the current measuring stick. That is a remarkably different list — only two films overlap in the Top 10. While Box Office Mojo also offers data for estimated tickets sold, you still get the same movies in the same order as above. So, for all intents and purposes, let’s just say that “Total Tickets” accurately represents how many tickets were sold for these films — adding in any re-releases in later years. If that was the case — if that’s what we thought were actually the most popular movies of all time — how would it change our (and maybe even Hollywood’s) perception of what was a successful film? Franchises aren’t as sure a bet as we might think. 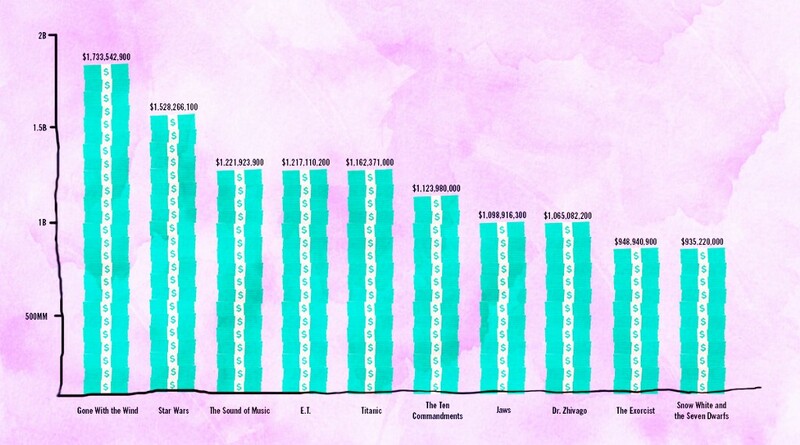 On the Total Dollars chart, 17 of the top 20 films are part of a franchise. (Titanic, E.T. and The Lion King are the exceptions — not including the straight-to-video The Lion King II: Simba’s Pride, of course.) On the Total Tickets chart, however, eight of the top 20 aren’t part of a franchise — and five of the top 6 and six of the top 8 aren’t. It’s almost as if these charts measure two different versions of industry success — one in which everything is endlessly, cynically recycled, and one in which stand-alone movies thrive. If movies like The Sound of Music or The Ten Commandments came out today, perhaps studios would be contorting themselves to figure out how they could make sequels, prequels or gritty reboots. But the Total Tickets list shows that, as much as Hollywood believes that franchises make good financial sense, audiences also like stand-alone films. In fact, certain non-franchise movies can be major blockbusters precisely because they can’t spur follow-up films. You could easily argue that Titanic was such a colossus in part because audiences loved its self-contained, no-room-for-a-sequel storyline. Guess what? Women actually see movies. Of course, many women enjoy action movies — just like plenty of guys dig romantic comedies and tear-jerking melodramas. With that said, Total Dollars is awash with testosterone-heavy blockbusters geared toward young men. Now look at the Total Tickets chart, which at least gets slightly closer to appealing to both sexes. The No. 1 film, Gone With the Wind, is the most striking example, but you also have movies like The Sound of Music and Doctor Zhivago, which boast classic, sweeping love stories and female protagonists. To hell with the record-breaking weekend box office. If you turn 30 in 2016, you’ve been alive for 18 of the top 20 movies on the Total Dollars list — but only six of the films on the Total Tickets list. That’s a radical readjustment in terms of what we think is popular — and when those movies originated. Consequently, if we adopted the Total Tickets model, we would no longer hear (nearly every weekend!) the studios declare their latest effort to be “the biggest April opening” or “the best Presidents’ Day holiday release ever.” And maybe it would start a shift away from Hollywood’s obsession with making its business a horse race that every news outlet feels compelled to trumpet on a weekly basis. That’ll never happen, though, because Hollywood desperately needs the kind of splashy headlines that gigantic box-office grosses provide. The industry is feeling the economic pinch from myriad competing entertainment options — video games, the internet, television — as well as audiences’ growing desire to consume movies somewhere other than a theater. So it’s crucial that the movie business endlessly promotes record-breaking weekends: It gives the impression that movies are as popular as they’ve ever been. Studios might stop relying on gimmicks to make big(ger) bucks. Obviously, studios want to make as much money as they can, so it’s no surprise that they’re pushing novel viewing platforms with steeper prices. But there’s no reason why box-office charts should reward that greed by favoring event films that disproportionately utilize IMAX and 3D. Yes, a film like The Jungle Book will always be a hit — but its box-office success is exaggerated by the number of 3D screens it’s on, which wouldn’t have been a consideration 10 years ago when 3D was thought of as an old-timey gimmick. To be sure, there are drawbacks to adopting the Total Tickets model. In the 1930s, Americans had a lot fewer entertainment options than they do now, so movies like Gone With the Wind commanded a larger percentage of the country’s disposable income than even Captain America: Civil War can enjoy. (Plus, there were no VHS tapes or DVDs or VOD to cut into the theatrical market.) But at least Total Tickets fights against the blockbuster glut that has clogged box-office charts and, by extension, the way Hollywood approaches its business. Alas, studios are forever concerned with dollars, not sense. But paying more attention to the Total Tickets model offers a necessary corrective — and a reminder that not every new blockbuster is the biggest of all time, no matter what the charts (and Hollywood) say.